The ADM-160B (MALD) is a low-cost modular air-launched programmable craft that accurately duplicates the combat flight profiles and signatures of US and allied combat aircraft. It is a flexible and modular system that has the potential to keep aviators and aircraft out of harm’s way. It is an expendable air-launched flight vehicle that looks like a U.S. or allied aircraft to enemy integrated air defense systems (IADS). The U.S. and its allies can confuse and deceive enemy IADS by sending a formation of MALDs into hostile airspace. After it is launched from its host aircraft, MALD flies a preprogrammed mission. In addition to protecting valuable aircraft, MALD offers counter air operations to neutralize air defense systems that pose a threat to U.S. and allied pilots. MALD-J is the jammer variant of the basic decoy, and the first ever stand-in jammer to enter production. The unmanned MALD-J navigates and operates much closer than conventional EW to the victim radar when jamming the electronics. 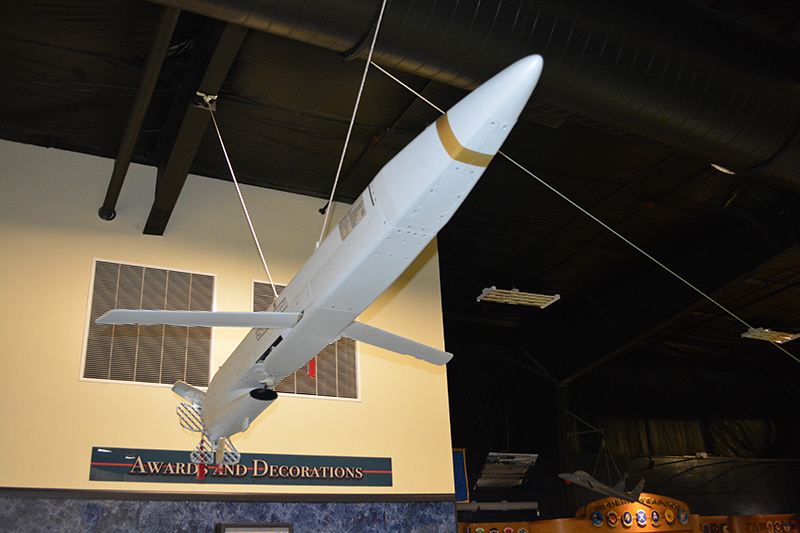 It is able to loiter in the target area for an extended time period, operate alone or in pairs, but is designed to work with and leverage other electronic warfare platforms. Its 14-inch lug spacing is compatible with most strike aircraft and is fully integrated on the B-52 and F-16. It can dash 200 miles and then loiter for 50 minutes or fly up to 500 miles. It navigates with a GPS-aided Inertial Navigation System (INS) and is designed to work with or without a “smart” (Mil-Std 1760) aircraft interface. It is powered by a Hamilton Sundstrand TJ-120 turbojet The Raytheon program was started in 2003 resulting in the roll out of the Decoy in March of 2009 and the Jammer variant in Sept of 2012. This ADM-160 display model is a refurbished qualification round used in System Design and Development in 2008.